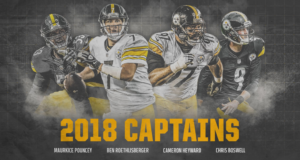 Congrats to the 2018 Steelers Team Captains! That definition fits for the Steelers 2018 team captains. Steelers’ players voted on Monday for the captains, and Coach Mike Tomlin announced the results to the players before they came off the practice field. This year’s captains are Ben Roethlisberger, Maurkice Pouncey, Cameron Heyward and Chris Boswell. Heyward, who is in his eighth season, is a defensive captain for the fourth consecutive year. “It’s always an honor,” said Heyward. “To be voted by your teammates as a captain, I take a lot of pride in that. I get to represent my teammates. I just look forward to doing that, every day, on and off the field. Holding people accountable as well as myself.